THQ's reverse stock split is going to keep the company on the Nasdaq. It's mostly good news for struggling publisher THQ, which on July 9 implemented a "reverse stock split," converting every ten shares of stock in the company to one and increasingly their value accordingly. The move came following a warning that the company could be removed from the Nasdaq stock exchange if it didn't get its share price above the one dollar mark and keep it there for a minimum of five consecutive days; at the time, THQ was trading at around the 60 cent mark. The reverse split was made, the stock price shot up to around $5.80, the Nasdaq is happy and now THQ has made it official, albeit with very little pomp and circumstance. "THQ Inc. today announced that it has received notification from Nasdaq that it has regained compliance with the minimum bid price rule for continued listing on The Nasdaq Global Select Market because the bid price of its common stock has closed at $1.00 per share or greater for at least 10 consecutive business days," the company said in a single-line news release. That's good news, but it's not all good news. 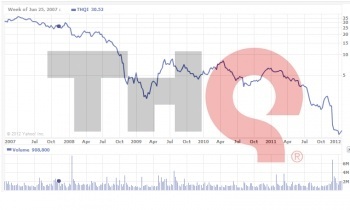 The bad news is that since peaking at $5.80 on the reverse split, THQ's share price has begun to slide again, going as low as $4.94 on July 17, less than two weeks later. It's bounced a bit since and currently (at least as current as my "I'm not paying for this" stock quotes get) sits at just a hair over five dollars , and while stocks naturally bounce up and down over the course of a day, a week or a month, my untrained eye detects a pronounced downward trend in the price. With a ten-to-one reverse split already on the books, another slide below the one dollar mark means there won't be much left to do but set the whole thing on fire and catch a plane to Barbados.